Who it's for: If there are spell casters, including witches or people who use voodoo who are out to get you and you need protection from them, this is the spell to choose. This spell will place a spiritual barrier that will work off of your goodness to deflect all incoming magic. Finally go about your life knowing that curses and magic can no longer effect or harm you. This spell can be ordered for the protection of somebody else if you wish. Why are my spells so effective? Why choose me to remove a curse on your behalf? I am a High-Priest, who specializes in powerful ancient Haitian Voodoo spells, curses, and curse removal. I perform a variety of voodoo rituals that have been proven to work time and again, and that consistently channel powerful forces to change people's lives for the better. The forces at work behind what I do are not easily understood by the average person, but the consistent results and sheer number of repeat requests for my services are proof enough. I, High Priest Jean Emmanuel perform all the rituals myself, but unfortunately the number of spells and curse removals that I can perform is limited due to the intensity of the ritual and the time spent personalizing it for each person. It is best that you act now, or unfortunately you may end up stuck on the waiting list, while the curse goes unstopped. For some, a High Priest's services might be expensive...they are indeed among the highest on the internet. In some cases the fee to cast a spell or curse is as high as $997. But this is for good reason. The spells that will be cast are powerful, intense, and extremely effective, and get results. Simply put - when a person of my knowledge and ability accepts your request for a spell or curse, you are in for a life changing experience. I guarantee I will cast the spell for you, and try with all my power and all my spiritual energy to make it work for you. That is my honest guarantee. But please understand, this takes a lot of time and energy from me. If an entire month has passed without a result that you are satisfied with, I also guarantee I will do the spell again, with a spiritual partner to strengthen the spell. 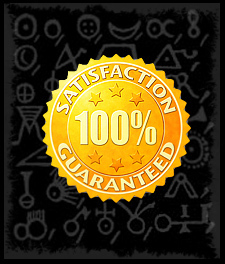 If you have read and accept this guarantee, then please proceed with the ordering process. Have me remove this curse for you. Click the brown button below and get started right away. Imagine what it will be like when your curse has been lifted and you get back your normal life and live just like everyone else. Order right now, and I will remove your curse AND cast a Secret Bonus Spell for you or anyone you choose! YES! High Priest J. Emmanuel, I would like you to remove my curse and at no extra charge, cast a SECRET SPELL that will greatly improve my life! The secret spell bonus offer is limited and may be removed at any time. Grab your FREE secret bonus spell by ordering today. How it works: Click the large button below to place your order to have a curse removed. After that, you will automatically be redirected to the curse removal portal where you can provide all of the information for your particular situation. Each curse removal is fully customized to work specifically for you per your request. I will review the details of your case and if more information is needed, I will contact you. Question: Does a person know a spell has been cast upon them or for them? Answer: No, they may feel something is different, but they will not know the source of the feeling, and will not be suspicious. Question: When you cast a spell for me, or lift a curse, is there a chance that dark forces will enter my life. Answer: No. My speciality is in using the forces of light to make positive change in peoples lives. Using dark magic is easy and is used by weak spell casters and witches as it is all they can do. An experienced spell caster will take the extra time and effort to work around dark forces. It is 100% safe. Order with confidence. The path to freedom from the curse and the forces of darkness that cause you or a loved one so much burden is just moments away. Jean Emmanuel ensures your safety and protection from dark forces. I guarantee I will cast the spell for you, and try with all my power and spiritual energy to make it work for you. That is my honest guarantee. But please understand, this takes a lot of time and energy from me. If an entire month has passed without a result that you are satisfied with, I also guarantee I will do the spell again, with a spiritual partner to strengthen the spell. Do not order a spell if you are not 100% certain you're ready for the consequences! *It may sound great to suddenly come in to a lot of money, but that can cause sudden problems with family members. *Having someone suddenly fall in love with you can be wonderful, but what will you do when they become jealous? *Getting your annoying co-worker fired by using a powerful Voodoo Curse might feel gratifying at first, but remember, he or she might have a family to feed.